Inflammation - Not As Detrimental To Your Health As You Think? Inflammation – Not As Detrimental To Your Health As You Think? What happened the last time you felt pain in your body? Did you reach for an ibuprofen or go to your doctor for a prescription drug? If so, you may have suppressed your single most essential bodily function for healing. Too often we think of inflammation as something to get rid of and instead choose to medicate our pain, swelling, or stiffness with drugs like Advil or Celebrex in an attempt to relieve the discomfort. However, what you might not know is that inflammation is, in fact, a critically important defense mechanism. It’s our natural siren to alert us that a body part needs attention — much like the call from the firehouse, which moves firefighters to action. When the primary pathway of inflammation falls short, then the secondary pathway steps in. Secondary inflammation, or what you may know as chronic inflammation, is a pathway of protection. It protects your cells from rapid destruction by allowing the tissue to change and adapt to the on-going stress in the area and can cause pain, swelling, stiffness and loss of function that signals to us that there is a problem that needs to be addressed. This is when most patients will self-medicate or come to the doctor for help. Unfortunately, when chronic inflammation remains for long periods of time and is not addressed adequately, it will cause the expression of genes that lead to degenerative conditions such as coronary artery disease, arthritis, cancer and others. 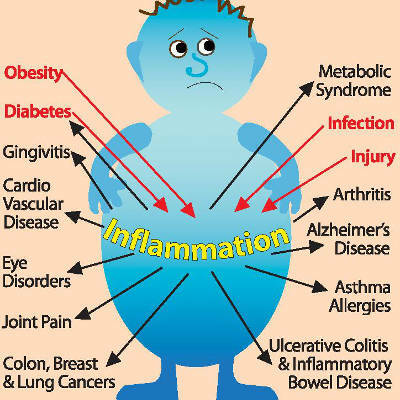 Latest Headlines » Wellness » Inflammation – Not As Detrimental To Your Health As You Think?